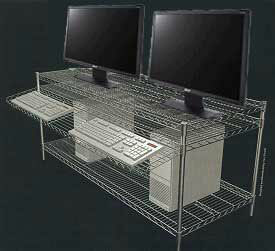 Wire shelving computer workstation units. Space At Work For Brooklyn College, Each unit holds the computer workstations, which includes 20" flat screen monitor, hard drive and keyboard. 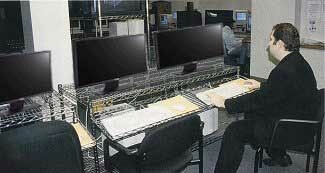 In addition numerous peripherals such as scanners, recording systems, and zip drives can be added to the configuration utilizing 24" wide snap on drop baskets at various custom heights and lengths. Equipment is valued at approximately $50,000 per unit. 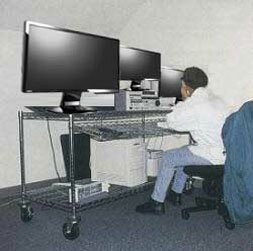 They are very confident that the product can securely support valuable workstations. They are very sturdy and flexible for a multitude of applications. The mobility of the units is also a great benefit.